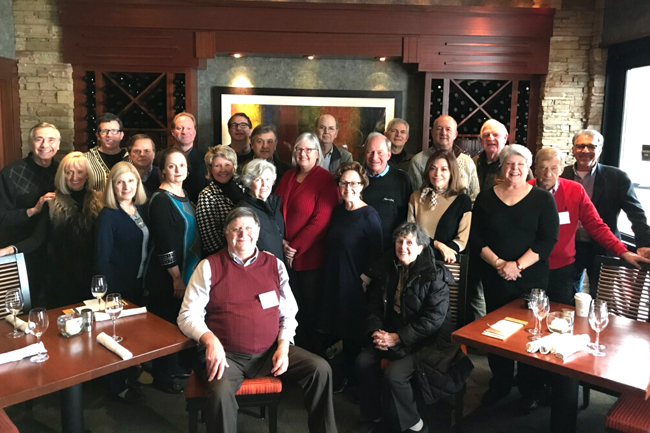 The Indiana Chapter had an outstanding meeting on Saturday, Feb. 3. The activities began with an enjoyable reception and lunch, during which time the members exchanged travel stories and anecdotes. After a fine lunch, we heard and saw an excellent presentation by Denny Grandle on Burma. There were 32 people in attendance. The next Indiana Chapter meeting s scheduled for Saturday, May 26, from noon to 3 p.m. at the Seasons 52 restaurant. It is located at 8650 Keystone Crossing, which is close to I-465 on the north side of Indianapolis. The speakers will be Dr. Bernard J. Strenecky (Bernie) and his wife, Eileen, who have sailed around the world twice; once in each direction from San Diego in Fall 2007 and Norfolk in Fall 2009 on the SS Universe with Semester At Sea (SAS). They have also sailed for a month in a program called Maymester in 2011 and 2012, both in Central and South America. Bernie is a university faculty member on board the ship and Eileen worked as staff, twice leading the Life Long Learners on the ship. Bernie and Eileen will talk about their experiences with SAS. The organization is administrated by the Institute for Shipboard Education, a nonprofit based in Fort Collins, Colorado. Colorado State University is its academic partner. Each Spring or Fall Semester, 540 university students from all over the United States and International Educational Institutions travel around the world on the World Odyssey with faculty, staff and Life Long Learners. LLL’s are people who wish to combine an academic experience as well as traveling and exploring ten or more ports in a semester. RSVP to Frank Basile at frank_basile@sbcglobal.net.